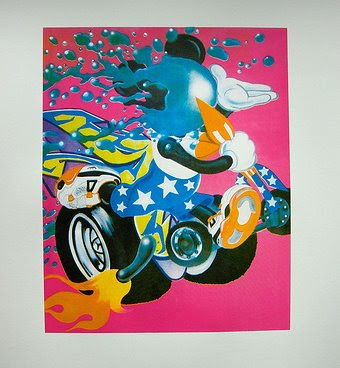 Graffiti artist Andy Seize has released a new limited edition print. The 'War Games' print pictured is a Limited Edition of 50-signed and numbered by the artist. It's a multi 4 layered hand printed silkscreen on 310 grams Southbank art paper. See more of Andy's work over on his flickr including some of of the murals he has painted around the Shoreditch/Old Street area. That's a really cool illustration. I saw his opening yesterday in Shoreditch and I was knocked out by the dynamic of his works. Also very sad to hear that the booze sponsor pulled out last minute and the artist had to buy it from his personal savings. But wait... Saving? Artist? In the same sentence? Hardly likely. Support the man and spread the word, his deserves it!